Anomaly is more than a few things. It's ambitious and beautiful. It's maybe a touch unoriginal in it's storytelling, but also a brilliantly original take on a multi-media format. I have been surprised that it hadn't been more widely covered in the genre press and the internet hive-mind, but maybe that is also not surprising given it's a hard project to pigeon-hole. 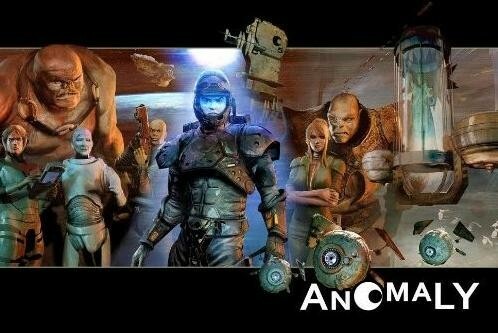 So what is Anomaly? It's a huge graphic novel, running to 378 pages (and 378, huge, wide, beautifully drawn and colored pages at that). The book itself is what caught my eye on the shelf of my local bookstore. It just screams the type of old school size and quality that you just don't see often enough from books anymore. I simply had to have it. When I was eleven or twelve my parents bought me a huge, hardback, version of the complete Trigan Empire strip by Dan Lawrence. It was such a gorgeous book, and was one of my prized possessions as a kid. The art was amazing, and the story, for all it's twee sci-fi genre standards had me hooked. My first reaction to Anomaly was very similar. It is a book to be cherished in that same way. People don't cherish books as much as they should these days. The art is great, a brilliantly realized space opera. The panels use the wide format really well, and the standard throughout is exceptionally high. It's a very painterly style, and works well for the story. If you want to see some examples, there are some preview images here over on Bleeding Cool. The story may stray close to cliche on occasion, high concept science fiction it is not, but it is an enjoyable adventure yarn. It's been compared to Lord of the Rings meets Star Wars, but for me the closer example might be imagining A Princess of Mars done with a Ridely Scott style aesthetic. Anomaly doesn't stop there though. It's more than just the book. You can also see, and hear, the entire book through a companion app, and the website at Experienceanomaly.com. A great voice cast lends their talents. Genre fans will recognize a lot of the actors involved, from gaming favorites like Dave Fennoy (who most recently voiced Lee in the Walking Dead) through genre regulars like Nana Visitor. The application also takes the opportunity to provide a wealth of background information and world-building. What was just a freighter in the background of a panel in the strip, suddenly presents you with an optional pop-out in the app that shows the design of the ship and it's specifications. It's a geek out dream! It all works to make the world compelling, and I think I'd enjoy future stories told in the same universe. The book itself does weigh in a bit on the expensive side (although it can be picked up at far less that the 75$ retail, through online outlets like Amazon, which has it at $45 as I write this), but for me it was an investment worth making. I adore books like this. Ambitious in format and showcasing great art. You can simply purchase the extra chapters in the app and view the whole thing within the app itself if you don't want the expense of a huge hardcover. It is worth it though. There is just something special about good quality, large format hardcovers that I adore. It brings back all those formative memories that twelve year old me forged with great science fiction and my imagination. This looks really interesting. I will give this a go. It's definitely recommended, and if you aren't sure, the investment in the app is minor enough to get a feel for what is on offer. The book is great though, well worth a slot on any bookshelf. I finally had time to start this. It's very cool.